Potato leafhopper remain at low levels in alfalfa across the state. Potato leafhopper populations can increase quickly when conditions are right. Remember to scout alfalfa every week to 10 days to monitor potato leafhopper populations. 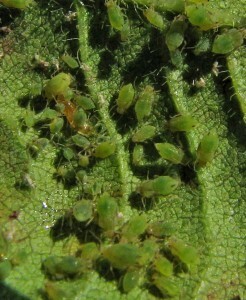 Kevin Ganoe (CCE Field Crops Specialist Central NY) reports finding the 1st soybean aphids of the year. Soybean aphid is the only aphid that will feed on soybeans. This pale yellow-green aphid is small at about 1/16 of an inch. It also has black cornicles, aka “tail pipes” on the posterior end of the insect. As the summer, moves along we will discuss more detail about IPM for soybean aphids. We have an online course on soybean aphid IPM at: https://pmepcourses.cce.cornell.edu/product?catalog=1401370478 You can earn you 1 recertification credit for New York State DEC certified pesticide applicators in categories 1a, 10, 21, 23. Jodi Lynn Letham (CCE NW NY Dairy and Field Crops Team) reports true armyworm in field corn. The armyworms moved from a hay field into the cornfield and were at high populations. She also reports that alfalfa weevil caused a lot of damage in regrowth alfalfa. Jeff Miller (CCE Oneida County) reports finding stripe rust on small grains like wheat, malting barley, oats, triticale and rye. 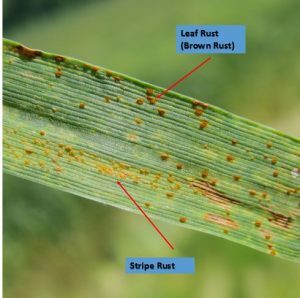 Stripe rust has also been found on wheat in Monroe and Seneca County. We have also found leaf rust in other parts of the state. The following photo shows the difference between stripe rust and leaf rust on small grains. Jeff also reported finding scald on malting barley. Depending on the susceptibility of the cultivar, scald can reduce yields. When scald starts to infect the flag leafs it will reduce the plants ability to produce grain and thus yield. Mike Stanyard (CCE NW NY Dairy and Field Crops Team) report high levels of pea aphids in alfalfa. 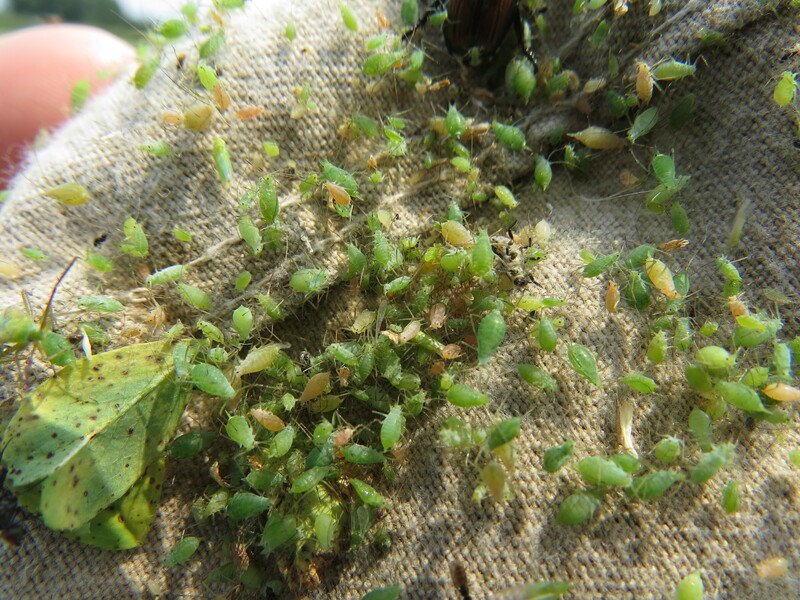 Pea aphids are generally not a problem for alfalfa in NY, but at times they can reach high levels. In NY, we have many predators and parasitoids of pea aphids in alfalfa. When an insecticide is used on alfalfa, it eliminates this very important aspect of control pea aphids, other aphids and insect pest in alfalfa. Sometimes when alfalfa is sprayed with an insecticide, you can get a resurgence of pea aphids at higher levels than before the application. The natural enemies have been eliminated and pea aphid and other secondary pest can re-surge. The Cornell University Willsboro Research Farm will hold an open house on Tuesday, July 10 from 1:30pm to 4:00pm. A tour of the facilities and research plots will leave the main office (48 Sayward Lane, Willsboro) at 2:00pm. Light refreshments will be provided. Research topics featured at this year’s open house include corn silage variety trials, adaptive nitrogen management for field corn, cover crops, juneberry nursery and production trials, Aronia variety plantings, honeyberry variety trial, high tunnel vegetable production, reduced tillage demonstration plots, season extension for early spring vegetables, organic pepper variety trial, and goldenberry and groundcherry variety evaluations. For more information call 518-963-7492. Our annual Field Crops field day held at Musgrave Research Farm in Aurora, NY is set for July 12th. The field day is free and open to the public and includes a BBQ lunch. Skip the registration line by PRE-REGISTERING! Last week temperatures ranged from 2 degrees below normal to 4 degrees above normal. Precipitation has ranged from less than ¼ “ to 3”. 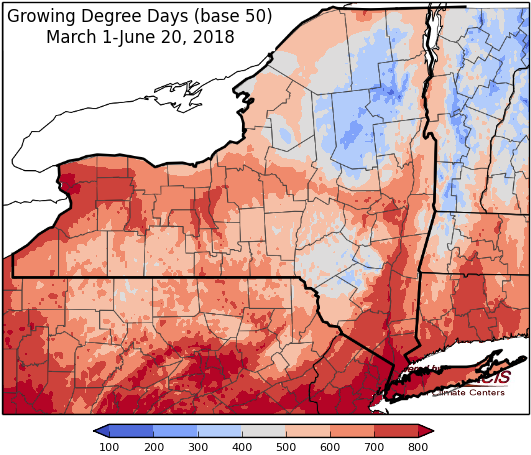 Base 50 growing degree-days ranged from 60-140. Abnormally dry conditions have been introduced for many areas in NY. Dry Thursday and Friday until a frontal system brings rain later Friday through the weekend. Today will be sunny with temperatures in the 70s and low humidity. Overnight lows will be in the mid 40’s to low 50s. Friday highs will be in the upper 70s to low 80s; clouds and light rain will spread into in western NY in the afternoon. Overnight temperatures will be in the upper 50s to low 60s. Saturday temperatures will be in the mid 60s and 70s with showers likely and some thunderstorms possible. Overnight temperatures will be in the upper 50s to mid 60s. Sunday shower continue, but will be more scattered. Highs will be in the 70s. Overnight temperatures will be in the 50s. Monday highs will be in the 80s with dry weather for most areas, northern NY may see some lingering showers. Overnight temperatures will be in the upper 40s to mid 50s. Tuesday will be sunny with highs will be in the mid 70s to low 80s. Overnight temperatures will be in the 50s. Wednesday highs will be in the 80s. Overnight temperatures will be in the mid 50s to low 60s. The seven-day precipitation amounts will range from half an inch to 1 ½ inch. The 8-14 day outlook (June 28-July 4) favors above-normal temperatures for all of the state. The precipitation outlook slightly favors above-normal amounts for all but the northeast corner of the state.